Every year I leave beautiful warm Hawaii where the palm trees are decorated with twinkle lights and Santa wears an Aloha shirt to venture home to freezing cold Pittsburgh for Christmas. As the song says, there's no place like home for the holidays! I couldn't agree more. After the 13+ hour trip back to the Burgh, it's like I've never left! Christmas Eve includes us running late for mass where we sit in the exact same pew as always, our small house filled with family members from both sides - the temperature quickly rising to an uncomfortable 99 degrees so we prop open the kitchen door to let the frigid outside air in, the kids are dying to know why they can't open their gifts NOW, Dad wants me to grab him a beer from the fridge downstairs, Mom's making a million things in the kitchen including punch with pink sherbet, our stockings are hanging on the railing of the stairs, the (artificial, since Dad is allergic to the real deal) tree is smothered in beautiful red & white ornaments and the cat is hiding underneath, I fill up on veggies and dip, cookies, shrimp cocktail, and wine before dinner has even begun - it's madness and it's fabulous! Christmas day is much different. We spend it with my Mom's side of the family, but the numbers dwindle down. Half of the kids spend the day with the other half of their relatives, people hang out with significant others and their families, ditch us for the movies, etc. This creates a relaxed, nice family day and dinner. We actually all get to sit around the table together and eat from real plates! My Aunt Linda was making lamb this year so I looked up a veggie to compliment appropriately and stumbled across this Forever Roasted Lamb with Roasted Vegetables recipe. I, of course, was only making the veggies. 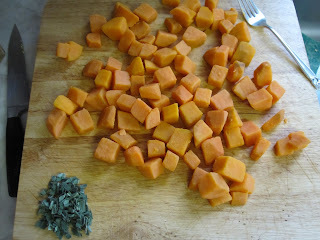 Peel and cut 2 pounds sweet potatoes & chop 1.5 tablespoons fresh sage. Boil sweet potatoes in salted water, reduce and simmer until tender. Aren't my sweet potatoes and sage pretty? 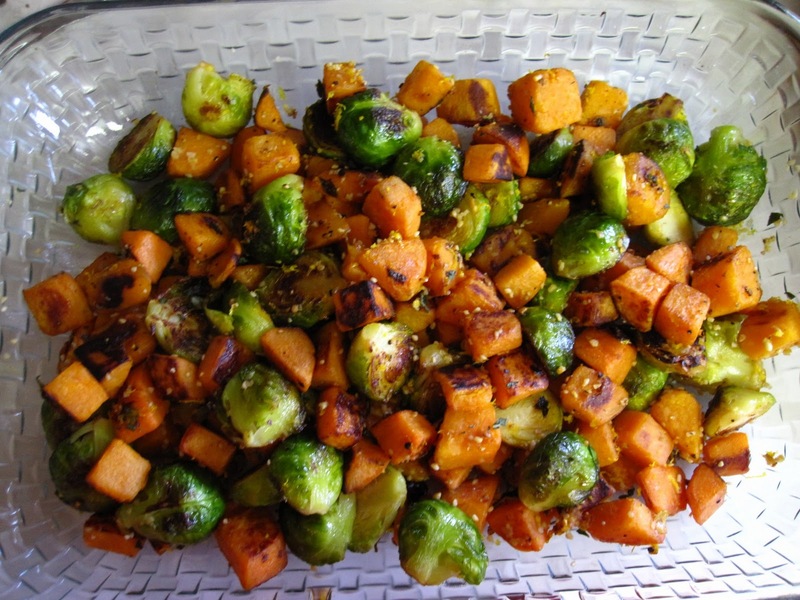 Clean, trim, and halve 1.5 pounds of Brussels sprouts - might I suggest buying extra sprouts? By the time you clean and trim them you lose a lot of weight! Boil the sprouts in salted water for 3 minutes. 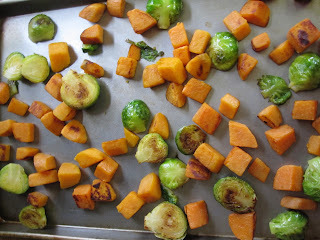 The sweet potatoes and sprouts FINALLY get to meet - in a saute pan over high heat with 1/4 cup olive oil. Toss them to coat with OO and do not disturb until the bottoms are browned. Flip & repeat on the other side. Next - salt and pepper the veggies and and bake in the oven at 425 for 15 minutes. After they've had 15 minutes of alone time, add the 1.5 tablespoons of fresh, chopped sage and 3 tablespoons of sliced garlic. Let that party last for 15 - 20 minutes or until the garlic is golden brown. Sprinkle 1 tablespoon of orange zest on them and enjoy the delicious orangey/garlicey aroma for a few minutes before you dig in! This is what mine looked like in Mom's adorable basket weave dish. This recipe is clearly beautiful and it's just as delicious as it is attractive. I took it to Aunt Linda's and got many compliments on it. Similar to the Strawberry Short Cake that was served over the same trip, the kids didn't want to eat the healthful items - oh well! 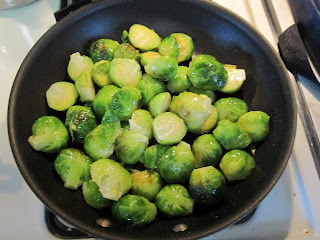 I'd never made Brussels sprouts before and was pleasantly surprised with the turnout. To be honest, I can't remember the last time I've even eaten a Brussels sprout. Will I make this recipe again? If someone's making lamb and I have a few hours to cook and clean, then yes! I'll let you know when that situation pops up again... Can you hear me laughing? !